Northrop Grumman employees assembled care packages for service members that include snacks, toiletries, phone cards and reading material. PALMDALE – Employee-led fundraising activities over a span of just three months at Northrop Grumman’s Palmdale site have netted more than $60,000 for men and women in the U.S. armed services. The site’s annual commitment to raise funds for the USO included a carnival and car show; bake sales; golf, bowling and tricycle racing competitions; silent auctions; and the sale of USO-branded apparel. Representatives from the USO Greater Los Angeles Area chapter accepted a check for the amount raised at a recent USO care package stuffing event in Palmdale. 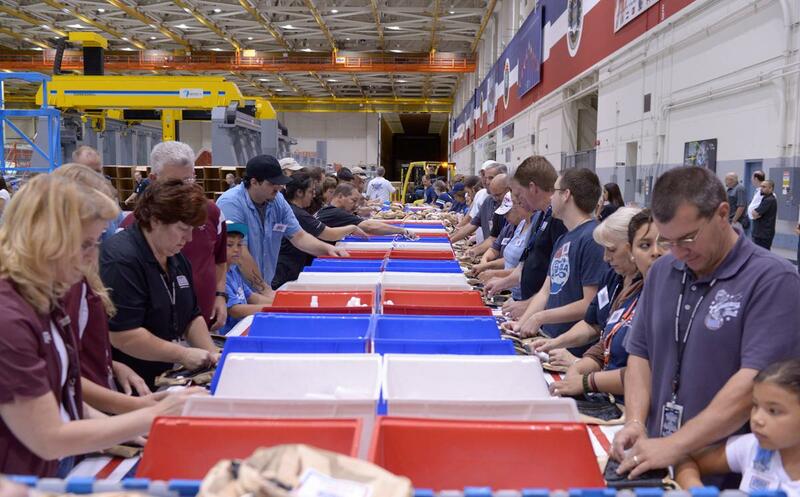 Northrop Grumman employees convert the Palmdale site’s manufacturing high bay into an assembly area for USO care packages. 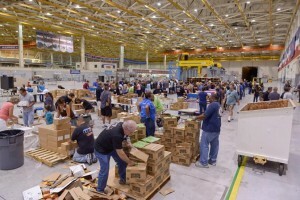 The facility’s manufacturing hangar, normally where the Global Hawk unmanned aircraft system and a major subassembly of the F-35 Joint Strike Fighter are built for the military, was converted into a different kind of production line where employees assembled more than 5,000 care packages for service members. The packages consisted of snacks, toiletries, phone cards and reading material. The USO is a private, nonprofit organization whose mission is to support the troops by providing morale, welfare and recreation-type services to American men and women in uniform. Northrop Grumman was the first corporate supporter of Operation USO Care Package. Since 2003, the company and its employees have donated resources, time and more than $1 million in ongoing support of the program. Northrop Grumman’s Palmdale site provides assembly, integration, testing and long-term maintenance capabilities for some of the world’s most advanced aircraft, including the F-35, B-2 Spirit and RQ-4 Global Hawk. The site employs more than 3,000 people.